For a couple of years I was actually a keen cyclist. My weekends would consist of working for five hours as a cleaner in the same engineering workshop as my Dad.For those five hours work I would receive £1.50. I would then go home, have lunch, cycle to where the afternoon ‘run’ was and do that. On Saturday there would be an all day trip out which meant my mum would make be a packed lunch and would be rid of me for the day. It was Phil who got me into the cycling club and it was largely with Phil that I stopped going. We had the bright idea of writing a ‘Rock Opera’ about Henry V which we were studying in English. In our minds we had no doubt that we would have a best seller on our hands and so, along with Dunc, we started spending our Sundays adapting Shakespeare for the Rock market. Naturally it only took a couple of weeks before we realised the limits to our talents. We didn’t even have to worry about the lyrics much, Shakespeare had done that for us. We were forced to admit that this project was beyond us. Now being at a bit of a loss with our weekends Phil suggested we go to Rugby practice at the local rugby club. I didn’t really like rugby but I didn’t like being bored either so one Sunday I found myself on a damp field outside Norfolk. And it was there that I first heard about Dr Feelgood. Anyway Phil had caught a program called ‘The Geordie Scene’ which was probably on at 7 am on a Sunday or something. TGS was a ‘pop’ program originating from, yes, Newcastle but I had never managed to catch unlike Phil who had been forewarned by the Daily Mail and had been therefore been most impressed by a Band called Dr Feelgood who had this manic guitarist who moved like he was clockwork. Truth be told I was rather jealous knowing that I would never get to see this performance for myself..ever. I was intrigued, it was possible I had heard about the band, this was 1975 and it was likely that I had heard of them through the music papers but so far I had not heard or seen them. Of course thanks to the invention of the interweb I can at last see that very performance and here it is. In truth the Feelgoods (as we now called them) were like no other, they were different. People like Alex Harvey or Bowie knew how to put on a show unlike most of the pub rockers who would shuffle about looking at their feet. The difference was that the likes of Bowie were clearly showmen who had planned their performance within an inch of their lives with lighting and costume changes. The Feelgoods, on the other hand were simultaneously very ordinary and very different. The noticeable thing about the band was the fact that they had suits and short hair. We are talking 70’s short hair here not real short hair, Guitarist Wilko Johnson actually sported a pudding bowl haircut the sort of which was the antithesis of mid 70’s cool. Apart from that there were the suits of course, again unremarkable by today’s standards but these were normal working suits allegedly worn because the band had initially come from their everyday jobs straight to stage. If this was the case things must have been fairly stinky in the workplace the next day as the Feelgoods put on a show the likes of which hadn’t been seen since the early days of the MC5.Singer Lee Brilleaux paced the stage with pent up aggression while Wilko skittered about very much like he was a clockwork toy in a manner that no one had seen before or, indeed, may ever see again. Drummer The Big Figure and Bassist Sparko simply needed to provide the backdrop for this display, they were simple but brilliant. When I finally got to hear the actual music, almost inevitably through John Peel, I couldn’t really make sense of it, it wasn’t Rock and Roll like Elvis or Showadywaddy but it wasn’t R&B like the early Stones or Blues like BB King. In fact Wilko had taken British rock and roll and R&B, most notably Mick Green from Johnny Kidd and the Pirates. Green was not, in fact the actual guitarist on the big Pirate’s hits but had adapted and developed the style of playing rhythm and lead styles simultaneously. Wilko had picked up on this underused style of playing and had become a unique player using his figures rather than a plectrum. On top of this he wrote songs which were simultaneously familiar and unique. Brilleaux had an aggressive vocal style which owed a debt to Howlin Wolf who had recently died and was also capable of blowing up a very acceptable harmonica which became part of the Feelgoods sound. I have to admit I loved this band, their first album ‘Down by the Jetty’ is not only one of my all-time favourites but is one that I still listen to and enjoy to this day. I saw the band with Wilko and without Wilko. I saw Wilko post Feelgoods, pre cancer and post cancer. Throughout the 90’s I would rant at anyone who would listen that the Feelgoods were every bit as great and influential as the MC5 or the Stooges but they had the misfortune to come from Canvey Island Essex rather than Detroit. In fact time has served the band well largely thanks to Julian Temple’s film ‘Oil City Confidential. Which served to remind us what a great band they were and to enhance their legacy. In fact its frightening to observe the band’s decline post Wilko (in fact following on from last weeks post, the final straw for him was the band’s decision to record a Lew Lewis song rather than one of his own for the third studio album). Just listen to a copy of their singles CD to witness a decline in quality and a complete loss of purpose following his departure. Brilleaux, of course, died in 1994, his death being eclipsed by that of Kurt Cobain. 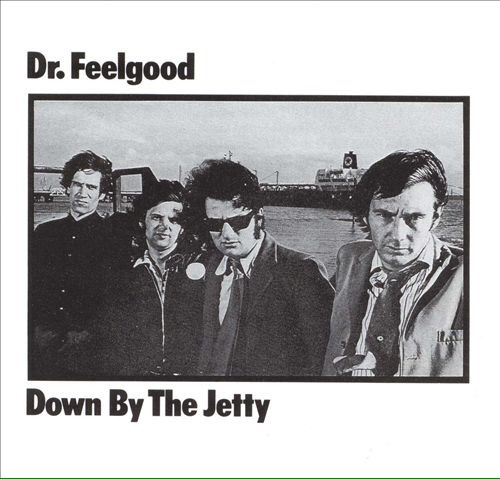 The band had struggled for the last ten years when Brilleaux was the only survivor of the glory years and the fact that the current Dr Feelgood are an uninspired bunch or hacks probably reflects that by his death the band’s stock was at an all-time low. Johnson also had his wildness years playing pubs to diminishing audiences but was rehabilitated as a national treasure in Temple’s film and his subsequent amazing recovery from the brink of certain death has only added to his appeal. Today he is a modern bluesman despite having the whitest voice ever, performing songs that are generally 40 years old and still being a big draw. The worst thing that could have happened to the band of course is that they had stayed together. The band ultimately had a very limited template and any departure from this would have diluted their sound. The fact that Brilleaux is dead and Wilko was low profile for a decade of so has meant that the band haven’t had a chance to sully their reputation. So what have the Feelgood’s got to do with punk? The general wisdom is that the band were John the Baptist to punk’s Jesus and that’s a pretty good analogy. The band started a trend for short sharp songs and energy levels but had dipped seriously by the mid 70’s. When I first got my copy of ‘Down by the Jetty’ I sat down to play along on my drums. Halfway through ‘She does it Right’ I was starting to experience cramp! A couple of years down the line the song sounded a lot more pedestrian but at the time it was like a rocket. The band were the first real stars of pub rock, let’s leave Ace out of this ok? They helped develop the infrastructure for the next generation giving birth to Eddie and the Hot Rods and helping fund Stiff records. Although Punk was to have no truck with pub rock or R&B Wilko’s guitar style was to prove as influential as Johnny Ramone’s, anyone with a fender telecaster (Hello Joe Strummer) was probably influenced by Wilko but consider also Paul Weller’s sound with the early jam, part Wilko part Townsend, the influence stretched even as far as Andy Gill’s playing with The Gang of Four. But most of all they showed a way forward as an alternative to the idea of the sensitive musician creating a work of art. The Feelgoods were no nonsense and stripped down. The Big Figure didn’t feel the need for a gong or a glockenspiel, Wilko had an amp, a guitar lead and a telecaster. This all pointed the way forward to a potentially different musical future which resonated with all us less talented musicians.